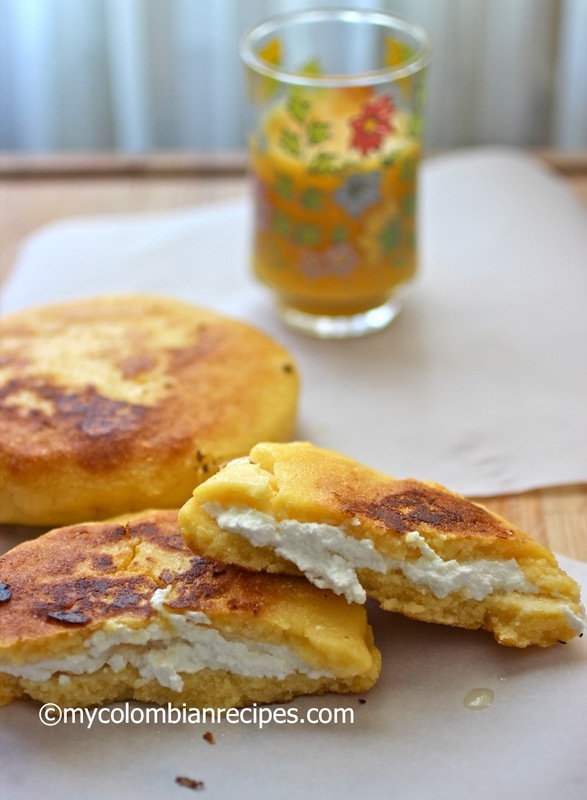 Arepas are a very important part of Colombian cuisine, as tortillas are for Mexican cuisine. In some parts of Colombia, like in my hometown of Antioquia, we serve arepas with almost every meal. I could eat them morning, noon and night with an array of toppings. There are many different variations, shapes, and sizes of arepas throughout the country, depending on the region. 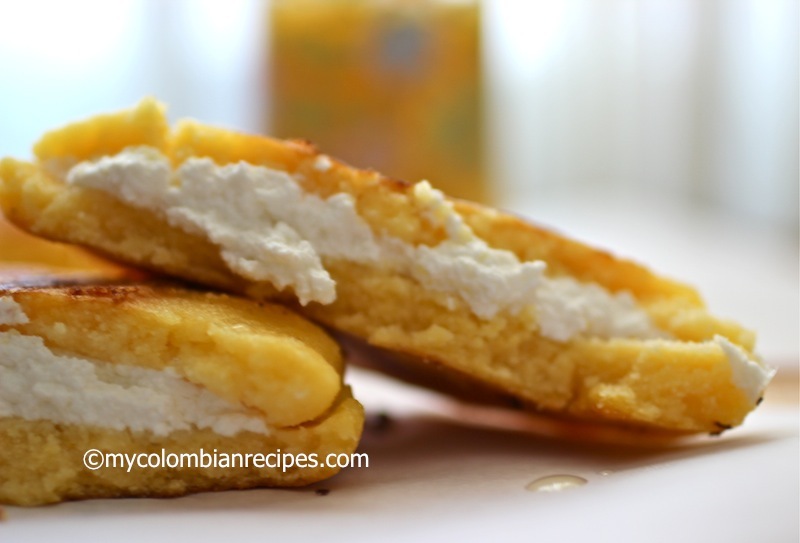 This Arepa Boyacense is from El Boyacá department of Colombia, located in the Andean region of the country, and it is made with yellow pre-cooked corn meal (masarepa), all purpose flour, sugar and fresh cheese. I love the combination of sweetness from the sugar with the salty cheese. This Arepa Boyacense is absolutely delicious. 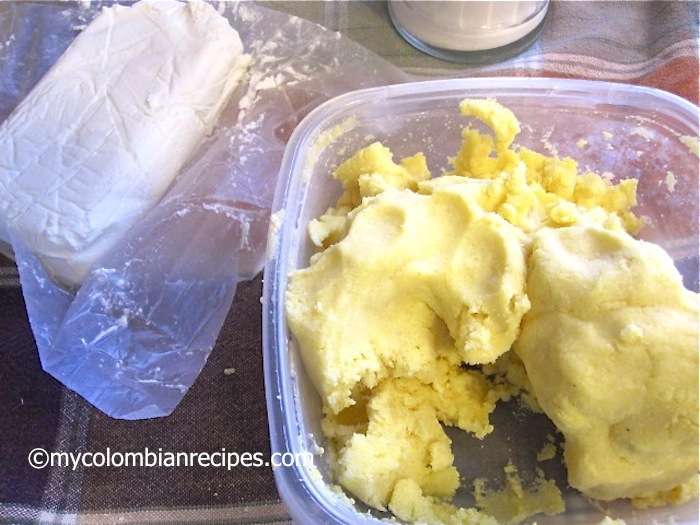 In a medium bowl mix the masarepa, flour, water, milk, salt, sugar and butter. Knead with your hands for about 3 minutes moistening your hands with water as you work. Form 12 small balls with the dough. Place each ball between 2 plastic bags or parchment paper, and with a flat pot cover, flatten to about 1/8-inch thickness. Place cheese into the center of half the masa circles and top the with another masa circle of dough. 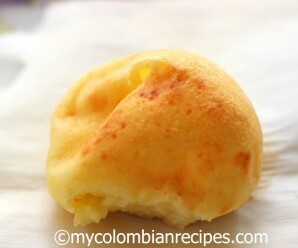 Using your fingers, seal the edges around the arepas, which will prevent the cheese from spilling out. 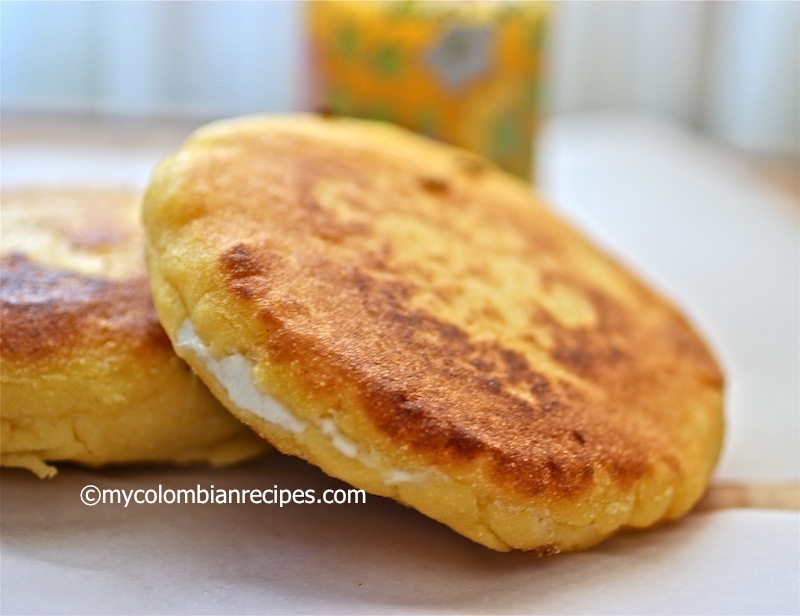 My sons are adopted from the Boyaca region and we have had such a hard time finding a recipe for these delicious arepas. They don’t consider any other arepa to be legitimate. The key seems to be the cheese, and the type of cheese used in Boyaca doesn’t seem to be available here. I’ll try your substitutes though and see if they pass the kid test! Try with cottage cheese but a bilogisch one, no chemicals no flavors added. This reminds me of the Venezuelan cachapa. This is a wonderful recipe that I will try one of thee days…how I wish I had you as a neighbor. You know how much I love my arepas…. 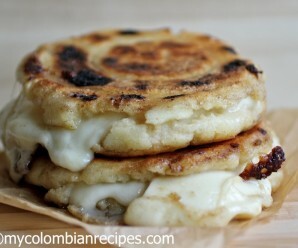 I lived in Venezuela for a couple of years, and cachapas were my favorite. But cachapas are very different from arepas, which are also eaten in Venezuela; they actually prepare them without anything inside, pop them open and then stuff them with whatever they want, (often, deviled ham). coast, they actually fry them with an egg inside. Yummy! Looks great Erica…love the fresh cheese in it. This looks and tastes amazing! Thank you for bringing a little of Colombia to our kitchens! Hola! 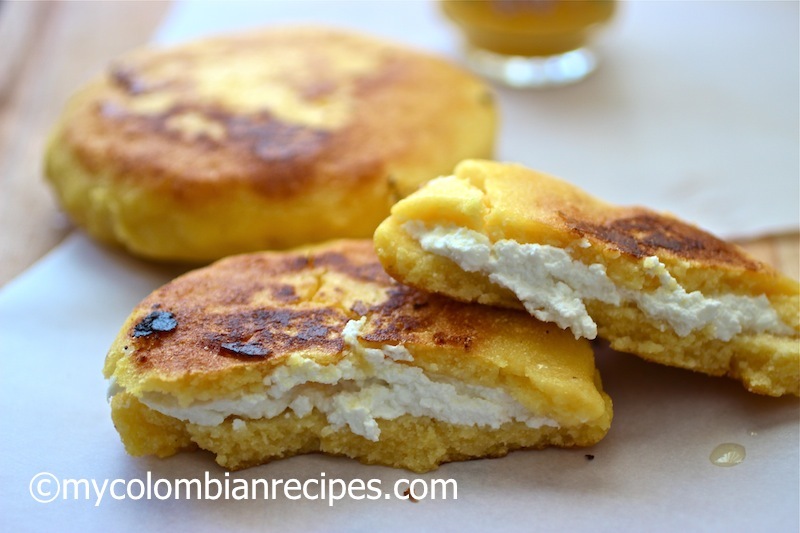 Me gustan mucho las arepas pero aqui en europa es muy dificil encontrar harina de maiz pre-cozida… no sabes si las puedo hacer com harina de maiz amarilla ( que no esta precocinada ne blanqueada)? Sabes de alguna receta mas tradicional que no use esse tipo de harina? Voy a mirar y te respondo mas tarde. Yo tengo la misma pregunta como Peg, porque aquí en Suiza tampoco no consigo harina de maíz pre-cocinada pero si encontré harina de maíz blanca en una tienda comestible española. He probado la receta con esta harina, pero la masa quedo muy empapada y fue imposible de amasarla y formar bolas. En los ingredientes mencionas Yellow corn meal, pero el link para MASAREPA es white corn meal. Por el color asumo que es la amarilla. 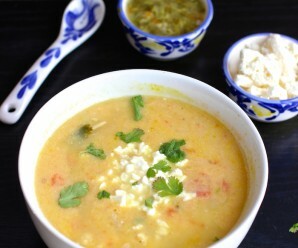 Sabes si otra marca de yellow corn meal funcionaría?. Yo no he visto MASAREPA en el supermercado. Paola- Es masarepa amarilla…es la misma solo el color es diferente yo siempre uso GOYA, por que es la unica que encuentro facil. Thank you, thank you, thank you!!! Arepas boyacenses are THE best! For your readers in the US, maybe this will help: In the area we live in Georgia, we used to find Goya Masarepa but can’t find it any longer. Harina P.A.N. works just as well, and although the yellow corn meal turns out beautiful, the white corn meal works too… Just have to make do with what we can find. But Maseca will not work! I use this masa to make tortillas as well. It’s become our favorite recipe for corn tortillas. I used PAN corn meal and these came out GREAT. 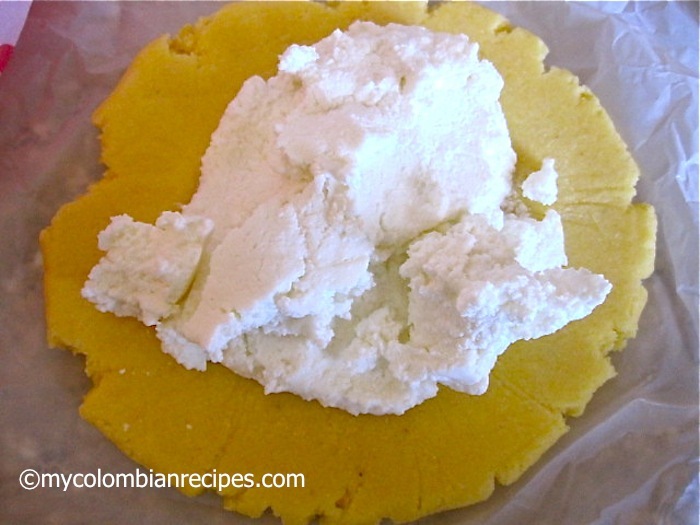 I wasn’t sure if Masarepa was same as PAN cornmeal but still worked… Can’t wait to make them for my mom… Hopefully she will remember these from Colombia (Baranquilla)…. These are very similar to ones I had in Venezuela in the mountains on the border (San Christobal) several decades ago – and I still like to make mine a bit sweet (and often add an egg) when I get Masa Arena here in Ireland. I mostly eat them with farmer’s cheese but I had never tried putting it in the middle and cooking it that way. That is done with tortilla flour (Mexican Masa) in Central America, but in Venezuela 30 years ago the cooked version was done with cachapas – a sort of corn pancake rather than arapas. I still make those too, you make them first, then add cheese and either fry or grill them together to make the cheese. You can either put two together for round versions or just fold them over. I really like your blog – also delighted to see how much arapas are now eaten in Colombia when I visited in 1979, at least in the border area they were uncommon in Colombia but popular again as soon as you got over the border. You know I love your arepas! This one sounds like I just have to try it! i was in bogota for three weeks and this was an everyday favorite of mine.. but the cheese. queso.. here is not near as good as there.they have huge blocks .much bigger than any here an prices for cheeses are affordable… but the said it was like mozzarella.. even out touring we could buy them on the streets. hot and fresh.. to die for.. just like churros and chocolate in Spain… the cuisine is different and most enjoyable in all places and makes an aventure in itself when travelling or at home to try something new!!! Bon Apetit!! I made these today, and they were very yummy and easy-to-prepare. I even did a few without the cheese filling, and they got extra crispy and yummy! I could certainly see this making a great breakfast. How do you actually eat them? Are they a breakfast, snack, side? I could see them tasting delicious with honey too. Without the cheese, they remind me a bit of Southern cornmeal hoe cakes. 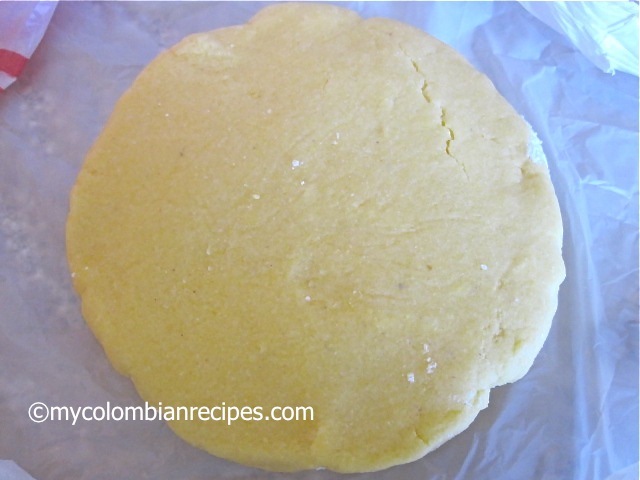 My first attempt at making my own arepas… They were delicious! I like that this recipe calls for milk, melted butter and sugar in the dough rather than just the standard water and salt. They came out delicious, but I used mozzarella cheese inside instead. 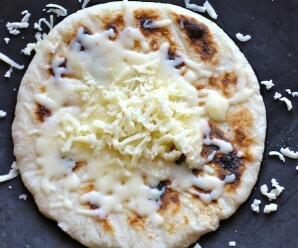 You can also use the same recipe for the dough, and cook each arepa in single layer for plain arepa instead off stuffing them with cheese. Also I floured the wax paper after the first arepa stuck to it and it didn’t happen again. I made these for my son this morning and her gave me the nod to keep them on the menu in the future. Thank you thank you for such a delicious recipe. My Colombian wife and I were recently traveling through Ventoquemada, Boyacá and stopped for some Boyacá arepas (which are sold everywhere along the highway). 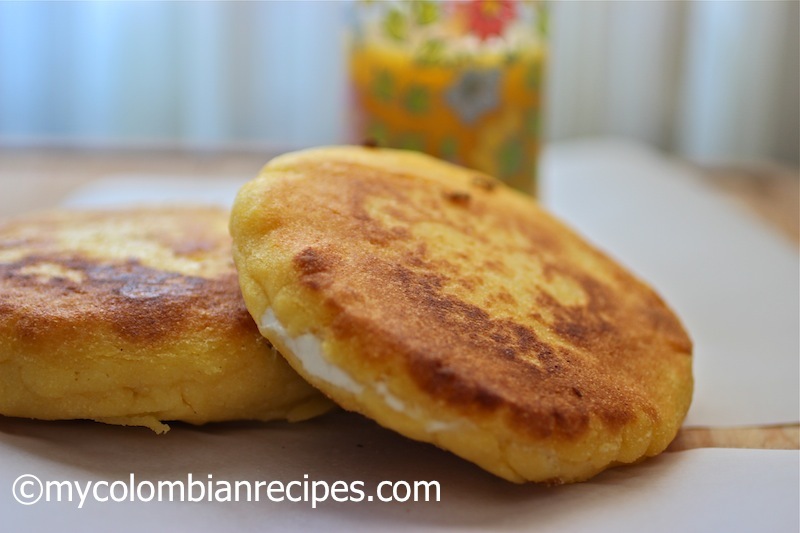 This recipe makes almost identical arepas to those I remember in Boyacá. I think the secret is in which cheese you use.